So there are a few things common to every Thanksgiving feast, one being a crowd of family around. As much as we love our families, sometimes we just want to sit down for a nice meal with just the two of us (insert “aw” or *snicker* “sap” here). As lame as it sounds, my husband and I are both so busy and we rarely get to sit and enjoy a dinner without yelling “Margot, NO!” (Margot is our dog) or thinking about our respective work. Before Thanksgiving we decided to do a “Jen and Brad Thanksgiving,” which, by the nature of being a “Jen and Brad Thanksgiving” would be slightly less traditional than the one we’ve had with our families. First, it’s a Thanksgiving for two (and whatever ends up on the floor for the dog). Second, 1/2 of the feasters doesn’t eat turkey. Third, we have busy schedules and can’t really spend the whole day or days before preparing for the feast. So behold, the “Mini Thanksgiving Feast for the Carnivore and Pescetarian” emerged. There’s not really any awe-inspiring, creative recipes in here but I hope it helps those that are looking for a similar meal for the holidays now and in the future. I’ve split this into the traditional components of Thanksgiving: bird, sides, gravy, dessert. Enjoy! Peel and dice potatoes into 1/2 cubes. Put in slightly salted water and boil. Keep potatoes in water until soft when poked with a fork. Drain potatoes and put back in pot. Using a potato masher, mash potatoes. Add 2 tbsp butter and mix well. Add 1/2 cup half and half and mix well. Mix in rosemary and garlic powder. In a large skillet with a lid, heat the butter over medium-high heat until melted. Add half of the carrots to the pan and cook briefly just to sear, approximately 1-2 minutes. Transfer to a plate and repeat with the remaining carrots. Set aside. Very carefully add the whiskey to the pan and allow to evaporate for about 30 seconds. Reduce the heat to medium. Sprinkle the brown sugar into the pan and stir. Mix in the carrots, stir well, and cover. Cook until the carrots are fork-tender and the glaze has thickened, about 10-15 minutes. Serve immediately. Preheat oven to 400 degrees F. In a 9 by 12 baking dish, combine apples, apple cider vinegar, cinnamon, nutmeg and sugar. In a small bowl, mix flour, graham cracker crumbs, brown sugar and butter together using the tines of a fork and your fingers, working until even, small crumbles form. Sprinkle topping evenly over apples and bake 15 to 20 minutes until apples are just tender and topping is golden brown. We also had dinner rolls from our friendly neighborhood grocery store. 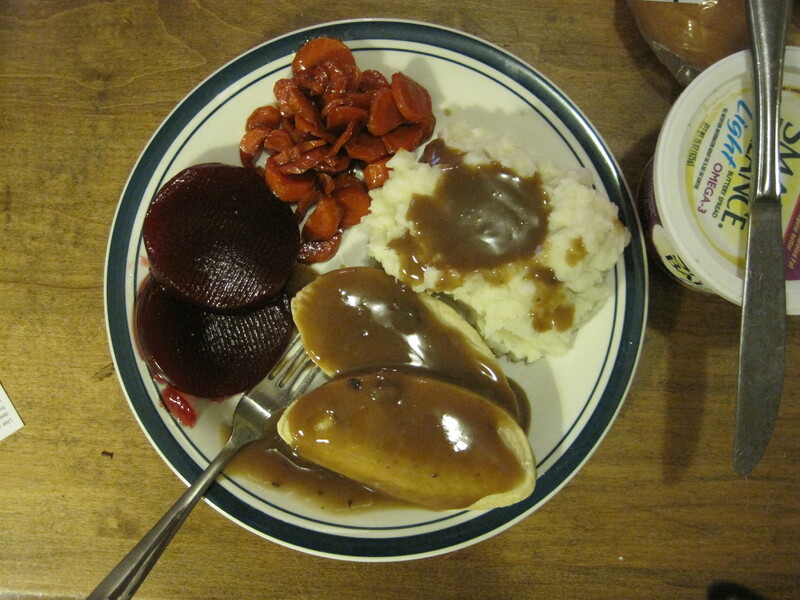 So behold, an easy faux Thanksgiving feast!